Changzhou Museum,founded in 1958,is a provincial comprehensivemuseum with a combination of human history,natural history and art. The currentcollection of cultural relics and specimens are more than 30,000pieces,among which there are 51 pieces of the national first gradecultural relics (one national treasure relics),245 pieces of thesecond grade cultural relics,2945 pieces of the third gradecultural relics.Among these treasures,the jade of the Liangzhuculture period,the proto-celadon of the Spring and Autumn,andWarring period,the lacquer and porcelain of the Song and Yuandynasty as well as the paintings and calligraphy of the Ming andQing Dynasties.The museum also sets up the only Natural HistoryMuseum for Juveniles in Jiangshu Province,owns 8148 pieces ofnatural specimens.It has formed six series of collections includingthe land fur animals,the ocean animals,the world insects,the localherbs, the mineral crystals and the fossils,among which such as thefossil bird Confuciusornis sanctus,the seashell Entemnotrochus rumphii,and the butterfly Teinopalpus aureus are rare in the world with very important scientific value. The two projects of Changzhou Museum and Urban Planning ExhibitionHall had been approved on March 23rd,2005,and start construction onMay 26th.They were officially open to the public on April 28 of 2007.The new museum is located at No.1288,LongchengRoad,Xinbei District,adjacent to the Changzhou MunicipalGovernment,and was officially open to the public on April 1st of 2007. The construction area of Changzhou Museum is 28,000 squaremeters,with the novel appearance,full equipped facilities,advancedfunctionality,and the characteristics of the ages.The show area isnearly 10,000 square meters with 10 exhibition halls.The maindisplays and exhibitions are consisted of two basic exhibitions,twospecial exhibitions and three temporary exhibitions.The basicexhibitions are the Changzhou History and Culture Display and theNatural Resources Display;the special exhibitions are the ArtMuseum of Xie Zhiliu's displays and the display of Mahoganyfurniture contributed by LiuGuojun.At the same time it acceptstemporary exhibition in terms of the different types and materials. 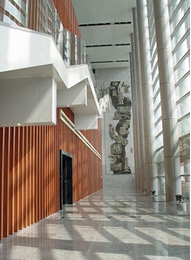 Since 2007,Changzhou Museum has received 3.37 milliontourists at home and abroad, and become the good promotion ofChangzhou and its external exchange,and the important window of VIPreception and tourists.Changzhou Museum has successfully wonthe“The National most Innovative Museum”,National Advanced Group ofCultural System,Civilization Unit of Jiangsu Province,AdvancedGroup of Cultural Relics System of Jiangsu Province,ExcellentMuseum of Jiangsu Province,which is also acted as the NationalFirst-class Museum,National 4A level Scenic Spot,the PatrioticEducation Bases in Jiangsu Province and the Popular Science Base ofJiangsu Province. As the modern comprehensive museum of the first-classprefecture-level,Changzhou Museum is on a new look with superiorservice.We warmly welcome the domestic and overseas guests to visitthe museum.It will also make contributions to enrich thepublic spiritual and cultural life,carry out international culturalexchanges and construct the socialist culture in the future.